Home » Kia K900 » What Interior Features are Included in the 2019 Kia K900? 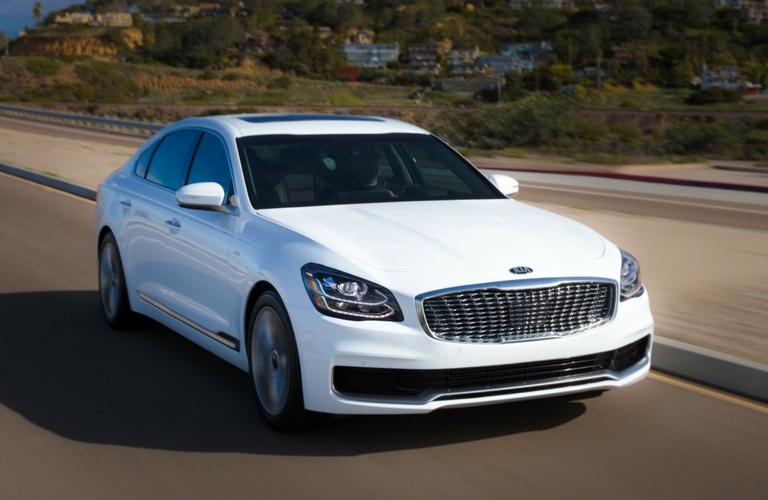 Back with a fresh redesign, the all-new 2019 Kia K900 establishes a new standard of luxury for Kia. With a starting MSRP of $59,990, the K900 is an attractively priced luxury sedan that offers a wealth of features and a remarkable driving experience. This guide serves as a preview of what interior features drivers can expect to find in the sophisticated 2019 Kia K900. 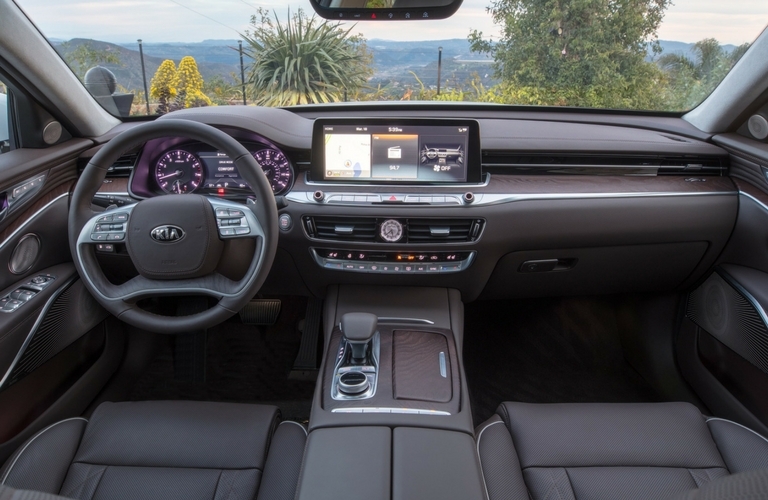 The 2019 Kia K900’s standard 12.3-inch high-resolution touchscreen display is among the largest in the Kia family. The touchscreen features an enhanced user-friendly design with pinch-and-zoom and split-screen capability. Using proximity sensors, the controls below the display illuminate when your hands approach. Mood lighting controls for the K900 can be accessed using the touchscreen. With a selection of over 60 colors, this feature allows you to customize your vehicle’s atmosphere to your unique tastes. What Comes with the VIP Package? With the available VIP Package, passengers of the 2019 Kia K900 can enjoy an enhanced level of luxury from any seat. At the wheel, the K900’s instrument cluster is upgraded to a 12.2-inch LCD display. When the blinker is engaged, the tachometer is replaced with a blind spot camera display to aid in lane changing and accident prevention. Opting in for the VIP Package will also get you the Head-Up Display. This feature projects important driving information such as speedometer readings, safety alerts and turn-by-turn navigation at the lower edge of your windshield. 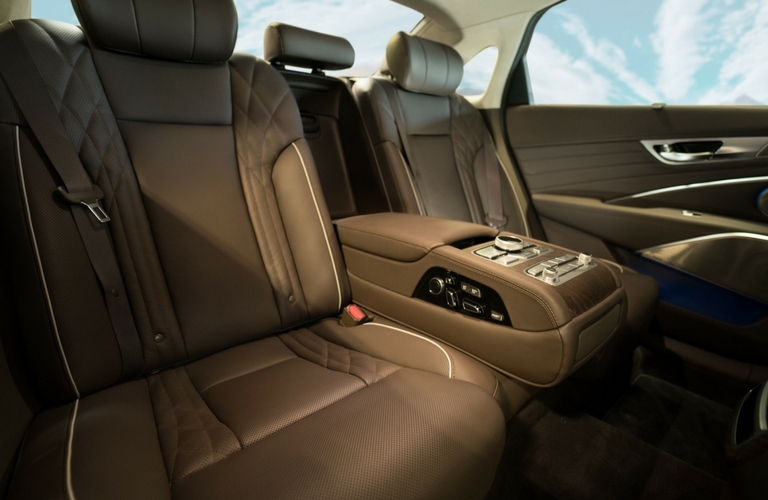 Rear passenger seats see big upgrades with the addition of the VIP Package. The improved design puts a 12-way power-adjustable seat on the left side and a 14-way power-adjustable seat on the right. Rear passengers also gain 4-way power lumbar support, premium headliners, seat ventilation and a wireless smartphone charging pad located on the center armrest. This entry was posted on Sunday, January 27th, 2019 at 6:03 pm	and is filed under Kia K900. You can follow any responses to this entry through the RSS 2.0 feed. You can skip to the end and leave a response. Pinging is currently not allowed.